The Johnson Cobalt Prospect – Cruz Cobalt Corp. The Johnson Cobalt Prospect is one of five cobalt prospects in Ontario, currently held by Cruz. 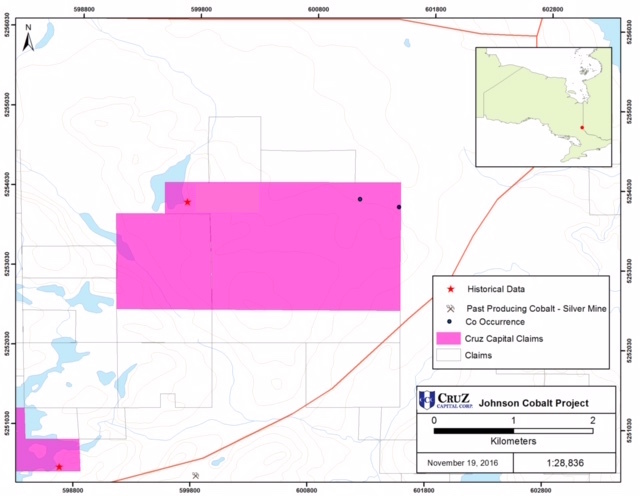 The Johnson Cobalt Prospect consists of approximately 900 acres in the Kirkland Lake mining district of Ontario. According to a Province of Ontario Mineral file, the property returned historic COBALT, silver, nickel and copper showings. (historic data, needs to be reconfirmed). Management has commenced explorations on this property utilizing the flow through funds on hand. Cruz has recently completed an airborne survey over the Ontario cobalt prospects which has identified 6 primary cobalt targets. Cruz is actively engaged in acquiring and developing Cobalt assets in North America. Cruz has acquired numerous historically high grade cobalt assets located in North America. Seven cobalt projects are in Canada, one in Idaho, and one in Montana. The goal of the company is to make Cruz the foremost cobalt project generator and developer on the TSX Venture Exchange. Management feels that cobalt is at the early stages of a significant bull market and we are pleased to be positioning Cruz at the forefront of this cycle.